Check out the video below to watch these Lemon Bomb taste explosions come together. Not playing? Click here. 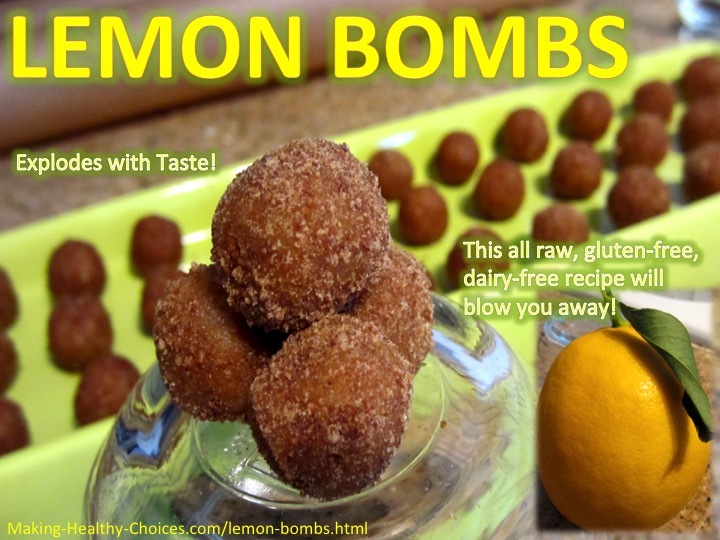 These lemon bombs explode with taste, this all raw, gluten-free, dairy-free recipe will blow you away! The idea with eating healthy food is to nourish your body while not sacrificing taste. The idea is to be able to enjoy all the tastes and flavours you love while at the same time nourishing your cells and feeling completely energized after consumption. This lemon bomb recipe just does that! With just a few simple ingredients, this recipe is so easy to make and will leave you with an energizing and uplifting healthy snack or healthy dessert that bursts with sweet lemon taste. Need more ideas of what to do with lemons? Click here. With this and many of my recipes, the measurements of ingredients that I give you are not exact. I encourage you to play. Start with a smaller amount and then keep tasting, mixing and adding until you get a flavour and texture that you LOVE. Always remember to start every single recipe you make with LOVE ... this is the secret ingredient that takes everything to the next level! When you make your recipes with love, they really do taste better. Everyone knows the power of good home cookin' made with love! Measurements are approximate - let your palate guide you! For this recipe I used a coffee grinder to blend and grind the ingredients. First, pour the lemon juice in a big bowl. Next, a little at a time, add the coconut shreds to your coffee grinder and grind them down to a fine powder, then add them to the lemon juice (the vanilla powder, lemon zest, coconut palm sugar and sea salt can all be mixed with the coconut shreds in the grinder). Do the same thing with the almonds. 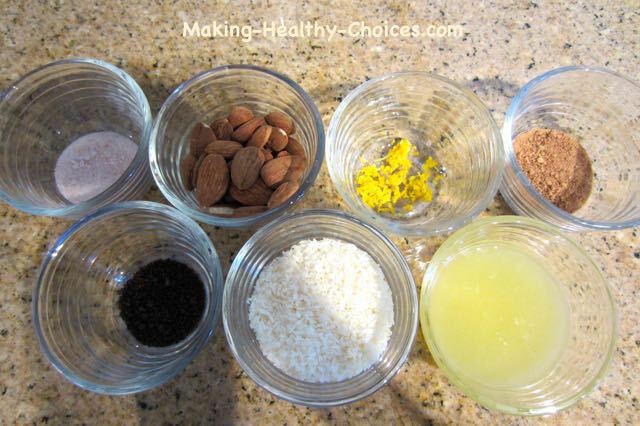 As you grind down both the coconut and the almonds you will notice that they both will release some of their oils. This is perfect as this will help this recipe to bind together. You can see how this looks in the video above. Mix all ingredients together in your bowl. Taste and adjust. Add more vanilla powder, coconut palm sugar, almonds or coconut until you get a taste and consistency that you are happy with. The consistency should be a thick dough that is easy to roll into balls. 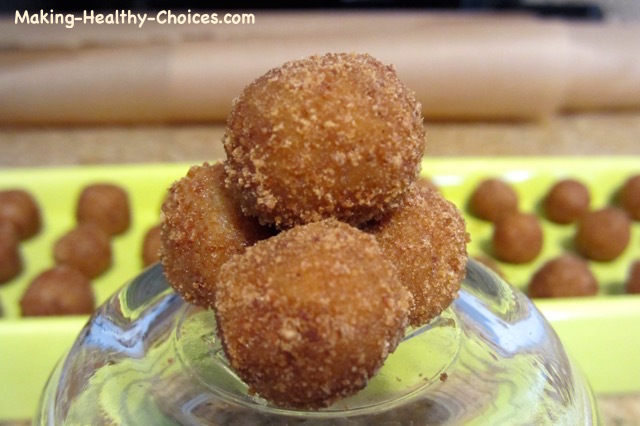 Once happy with your mixture roll into small balls about the size of a marble. 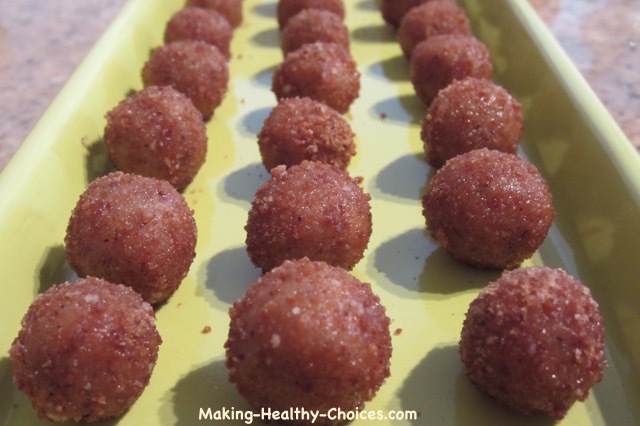 Coat each ball with some of the coconut palm sugar. The easiest way to do this is to put some coconut palm sugar into a small bowl. Drop each ball into the bowl and shake it around until evenly coated. Place on a serving tray and enjoy! Please refer to the video at the top of this page to see how this all comes together.